Like multilayered Jell-O desserts and recipes for funeral potatoes, Mormons come in a variety of flavors. From Molly Mormons and Peter Priesthoods who wonder if “never seen an R-rated movie” counts as a résumé-worthy skill, to Jack Mormons hiding beer in the garage, Mormons self-identify in ways far more complex than the simple “I’m a Mormon” tagline. And Mormons also create labels for those who share their faith—liberal or progressive Mormons referring to their orthodox mother-in-law as a TBM (true-believing Mormon), while she raises an eyebrow at her “fundamentalist” Mormon neighbor who homeschools all 10 of her children and never mentions the existence of dinosaurs. The church-sanctioned labels of “active” and “inactive” are far from sufficient in describing the nuanced relationships individual members have with the church. Some pursue unorthodox theologies within Mormonism, such as the Ordain Women movement. Others claim the title of “ethnic” Mormon to explain their adherence to cultural traditions or heritage, separate from literal belief. Many others could be described as “actively inactive,” participating in organizations and projects found on the “borderlands” of Mormonism, carving out a unique space in a faith that tries to push them away. Many view these borderland Mormons as heretics, spreading dissent and doubt, and assume that their continued involvement in church affairs represents an attack or threat to believing members. And those outside the church wonder why they don’t simply leave and never look back. “You can leave the church, but you can’t leave it alone,” said emeritus general authority Glenn L. Pace in a 1989 talk. According to Pace, the motives of former, inactive or unorthodox Mormons are clear: They’re simply “obsessed” with making “vicious” attacks on the church. But for many unorthodox Mormons, it’s in fact their spiritual beliefs, formed through their LDS faith, that have led them to their unusual relationships with the church. I currently identify as a “Frankenmormon.” I cherish the parts of my Mormon upbringing that taught me to stand up for my beliefs as I “try to be like Jesus.” Yet, these same teachings led me away from church activity, especially as the church intensified its opposition to LGBT rights and gender equality. One of the most painful experiences of my transition out of orthodox Mormonism involved discovering that someone I loved chose to define my existence based on how far I strayed from traditional Mormonism. This Mormon “knew” I couldn’t possibly be happy or good without the guidance of the one true church. I may love my daughter, but not enough to bless her with gospel teachings. This person openly wondered when my husband, who remained active in the church, would leave me for someone capable of raising an eternal Mormon family. When we had the same religious beliefs, this person admired my convictions and devotion to seeking answers, but without Mormonism, these characteristics represent nothing more than stubborn arrogance and a need for attention from strangers who read my blog or City Weekly columns. It’s easy for traditional members to disregard the experiences of their non-believing or unorthodox peers; it’s a commonly held belief that people who leave the church have succumbed to the deceptions of the devil but still know, deep down, that the church is true. But many Mormons, including some members of church leadership, acknowledge that sources other than Satan may prompt people to question or leave the church. And as new generations of Mormons use online communities and resources to investigate both the history and current policies of the church, they’re finding new ways to identify with the faith that shaped their early belief system. The following profiles represent a new ward directory, a guide to Mormonism outside literal belief or orthodox practice. And as far as I can tell, no one has Satan on speed-dial. Michael Ferguson is deeply familiar with what goes through a person’s mind after they leave the church—both from personal experience and from his research as a Ph.D. student at the University of Utah, mapping the impact of religious activity on brain functioning. 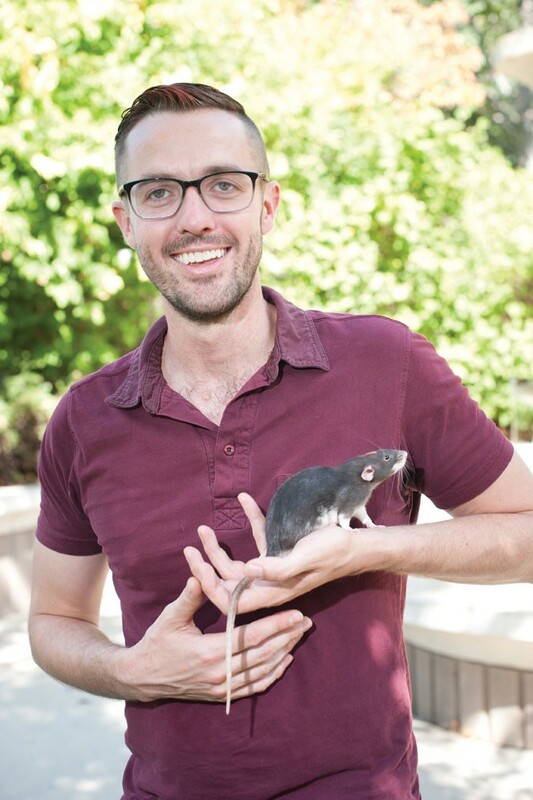 Raised in an active LDS home, Ferguson—who now calls himself “Mormon by default”— describes his Mormon upbringing as “idyllic.” He did temple-ordinance work as a young adult, and spent years participating in “conversion” and “reparative” therapy until his acceptance of his identity as a gay man dramatically disrupted his faith. He moved away from orthodox Mormonism, marrying his partner, Seth Anderson, in 2013. They were the first gay couple married in Utah. He says it’s OK to not be a “cool and collected” ex-Mormon who no longer feels pain from leaving the church. He sometimes has “spooky Mormon hell dreams,” he says, but, like many unorthodox Mormons, Ferguson takes comfort in maintaining the semiotics of Mormonism, the cultural practices and rituals that ease the pain of transitioning from one’s origin religion. Ferguson, who’s also a research fellow with the Human Neuroscience Institute at Cornell University, uses his findings from the Religious Brain Project to explain why people maintain relationships with Mormonism even when they stop believing the claims of absolute truth that are central to the religion. A part of our brain known as the default-mode network, he says, helps monitor the social attachments that are created by interaction with family and community. An individual who’s part of the close-knit community fostered by Mormonism would struggle to “detach” from the social network hardwired in their brain. For some, Ferguson says, detaching from one’s primary community of family and church might feel physically painful and trigger a survival instinct commonly associated with a traumatic event. By “using a little biological imagination,” Ferguson says, it’s feasible to suggest that this survival instinct is what causes some Mormons to remain in a faith they no longer believe. Though he’s distanced himself from mainstream Mormon doctrine, Ferguson credits LDS theology with helping him accept his decision to live as an openly gay man. Ferguson realized denying his sexual orientation caused him to break his temple covenant to “fill the measure of his creation,” a promise encouraging members to live their faith in every aspect of their lives. Ferguson believes it isn’t a sin to be openly gay; drawing on the lyrics of the hymn “Redeemer of Israel,” Ferguson says that hiding one’s authentic self is the true transgression, and LDS policies regarding homosexuality force LGBT Mormons to feel like they are “wandering as strangers in sin” in their own church. Ferguson sees Mormonism as a microcosm for the general populace, as well as more established religions. As the LDS Church learns to accept its LGBT members, he says, it’ll set a template the rest of the religious world can follow. Ten years ago, John Dehlin was working as a seminary teacher, instructing high school students in church doctrine before school each morning, when he began delving into LDS Church history to prepare his curriculum. His findings on the Book of Mormon, the Book of Abraham and polygamy shook his faith. Since then, Dehlin and his family have struggled to remain in the church. In 2005, Dehlin founded the Mormon Stories Podcast (MormonStories.org), an online community that addresses Mormon experiences outside the norms of LDS culture. The podcast and sites like Stay LDS are designed to help LDS members navigate through difficult faith transitions while remaining active in the church. But, Dehlin says, some members should leave the faith. In June 2014, Dehlin and Ordain Women founder Kate Kelly received letters from local church leadership threatening excommunication. Kelly was excommunicated, but Dehlin currently remains a member of record in the church and identifies as “culturally and socially Mormon,” though neither he nor his family currently attend church, and Dehlin is unsure if he will ever return to full activity. Despite distancing himself from the church, Dehlin still believes that “so much of what is good about me comes from the church.” He credits the church with helping to raise him, and providing him with a framework to raise a successful family. Taking inspiration from Judaism, which evolved from orthodoxy to include a variety of beliefs, Dehlin hopes that the church will someday offer all members “a place at the table” instead of pressuring members and former members to “leave the church alone” after a change of faith. His belief in inclusion represents his “love affair with the expansive promise of Mormonism,” he says. He relates personally to Joseph Smith, who, he believes, founded Mormonism out of concern for his family and their place in the afterlife. In developing the doctrine of eternal families that leave no soul behind, Dehlin says, Smith saw himself as continuing a tradition that Christ began when he sought the lost sheep. Until then, Dehlin intends to use his voice as a “cultural Mormon” to encourage greater inclusion within Mormon culture. Attack of the 20,000-Acre Inland Port! A cautionary tale on how a similar project wreaked havoc on a small Illinois town. Somehow, the uber-Republican Legislature budgeted more than $29 million to improve Utah's air. That's not a typo. Their health on standby, thousands of low-income Utahns await to see if they'll benefit from Medicaid expansion. Shake hands with your devil-loving neighbor. Why are these 10 important stories so underreported?